Thin, but very warm and soft. Beautiful colors. Love the pillow shams! This ultra soft, floral, 100% cotton flannel will keep you warm on cold winter nights. Pointehaven's 5 oz (175 GSM) flannel is made from single-ply yarns for soft, durable sheets. Available in a variety of colors and patterns to match every bedroom. Twin duvet set includes: 1 duvet cover: 88 inches width x 68 inches length and 1 standard sham: 26 inches width x 20 inches length, Full / Queen duvet set includes: 1 duvet cover: 96 inches width x 92 inches length and 2 standard shams: 26 inches width x 20 inches length, King duvet set includes: 1 duvet cover: 96 inches width x 110 inches length and 2 king shams: 36 inches width x 20 inches length. 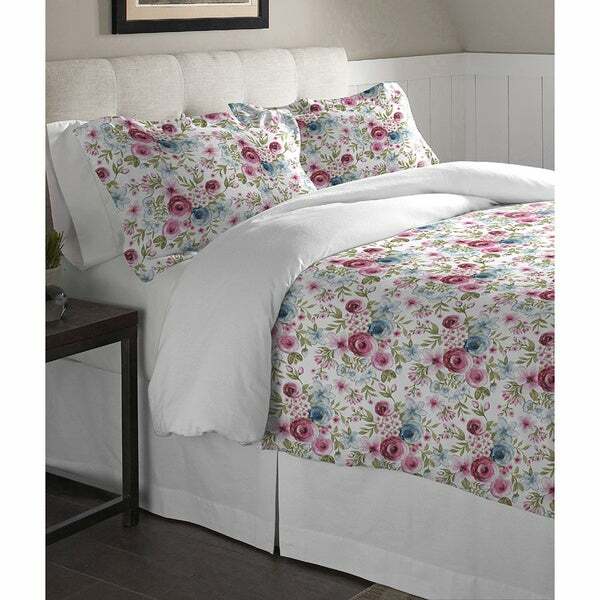 Was excited to order this duvet cover as it looks really happy and warm online. However when it arrived the print was actually much larger than seen in the photos and overall looks a bit crazy when spread out. Most likely returning. In the winter there is no better comforter cover then flannel, sheets too!!! I'm enjoying the bright colors, and the soft flannel feel. Quality is great but the colors are a bit crazy. Definitely not the muted tones the pictures imply. "Does this have tabs to attach to duvet?" This duvet cover has tabs/tie backs to attach to duvets.